Like ISwara motivated arjuna who withdrew from the battle to say as in SrI bhagavath gIthA 18.73 “karishyE vachanam thava” (I will fight as you said), here, he motivates ALavandhAr saying – even those with limited capabilities have praised emperumAn according to their gyAnam (knowledge) and Sakthi (ability) as said in “ishukshayAnnivarthanthE … ” (Soldiers are returning due to lack of arrows and not because of having destroyed the earth and the sky). Similarly, poets are withdrawing due to lack of knowledge on their part and not because of completely singing the qualities of gOvindha) and in thiruvAimozhi 5.8.4 “kANum aLavum sellum kIrthiyAy” (one who has qualities that grow as much as others can see); you too can praise [me] in this manner; vishNu dharmam 1 “sA jihvA yA harim sthauthi” – that which praises hari, only that is called tongue); the mouth is present only to praise me; as said in SrIvishNu sahasranAmam “sthavya: sthavapriya:” (he is praiseworthy and he likes to be praised), it is dear to me to be praised. Hearing this, ALavandhAr becomes convinced [to praise emperumAn]. ka: viSEsha: – what is the difference? 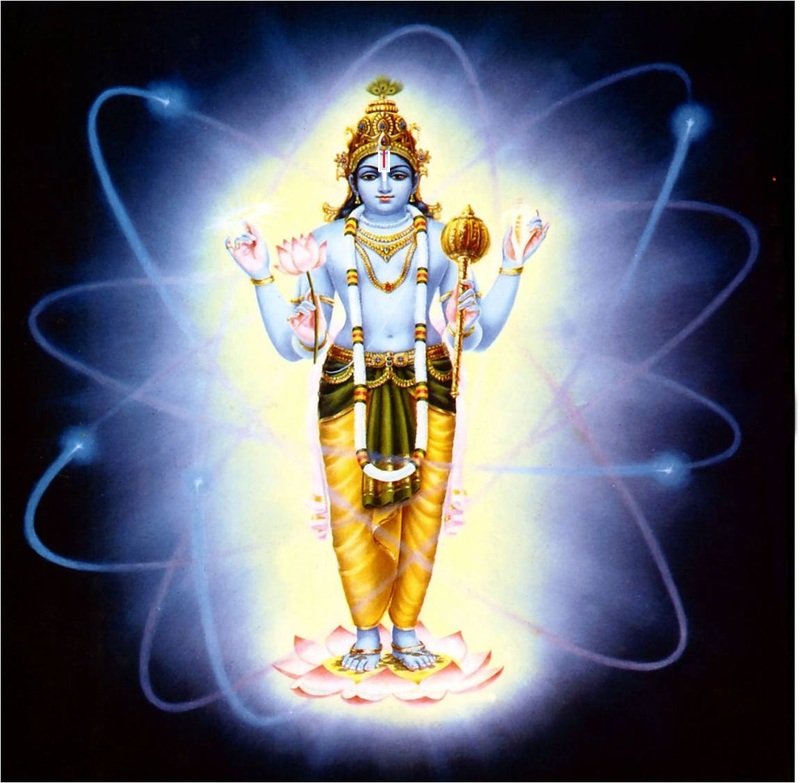 Or, I who am incapable shall praise until becoming tired or as much as I know; in this manner only the vEdhams that always praise, the four-headed brahmA et al are praising; what is the difference between a (small) atom and a (big) mountain which are submerged inside a huge ocean? yadhvA – [Or] answering the question [of why he continues to praise]; ALavandhAr is saying “My previous statement of ‘I cannot do this’ does not make sense”. SramAvadhi yathAmathi vA – [I shall praise] until I become tired or until to the limit of my gyAnam; Alternatively explained as – One can only praise to the extent of his/her knoweldge and ability. aSakthOpi sthaumi – Even if I am incapable in all aspects, I am praising. sadhA sthuvantha: vEdhAS chathurmukha mukhAScha Evam Eva khalu thE’pi – Those who are able to identify thyAjya (what is to be given up) and upAdhEya (what is to be pursued) and able to give up that which needs to be given up and pursue that which needs to be pursued. sadhA sthuvantha: vEdhA: – vEdhams which are always united with (focussed) on bhagavAn. chathurmukha mukhAScha – brahmA and rudhra who live for dhvi parArdha span of time [1 parArdha – 50 years of brahmA’s life, each year of brahmA’s life = 360 days, each day of brahmA’s life = 1000 chathur (four) yuga cycles and same amount of passive time in the night of brahmA] and sages sanaka et al who can glorify emperumAn to the maximum. Evam Eva khalu – Only according to the gyAnam (knowledge) and Sakthi (ability). thaiththirIya upanishath Anandhavalli 9.1 “yathO vAchO nivarthanthE …” (the words returned being unable to glorify bhagavAn‘s quality of bliss fully and even the mind cannot comprehend that); SrIvishNu purANam 1.9.59 “yannAyam bhagavAn brahmA jAnAthi paramam padham” (That abode which is not known to brahmA even); nAnmugan thiruvanthAdhi 10 “mAmalarAn vArsadaiyAn vallarE allarE vAzhththu” (brahmA who is born in the best flower and rudhra who has matted hair are not capable of praising bhagavAn); mUnRAm thiruvanthAdhi 21 “pEsuvAr evvaLavu pEsuvar avvaLavE” (emperumAn’s glories are as much as the speaker’s speech); mahAbhAratham mOksha dharmam 179.4 “na grAhya: kEnachith kvachith” (brahmA says – bhagavAn is not known by anyone including myself, rudhra and everyone else). Wehn asked “Even if this is the case, is there not difference between you and them?”, ALavandhAr says – Though vEdham is different from [i.e., greater than] brahmA and rudhra, they are all the same in being unable to fully speak about bhagavAn; similarly, even if they are different from [i.e., greater than] me, there is no difference in being unable to fully speak about him. maha arNAva anthar majjathOr aNu kula achalayO: kO viSEsha: – While very minute object (like a mustard seed) and a mountain are significantly different, when they are inside an ocean, there is no difference. This entry was posted in Other, sthOthra rathnam on December 21, 2016 by Sarathy Thothathri.